Are You Using These 7 Tips to Protect Your Identity? It may feel like keeping your personal information secure is impossible in a world tech-savvy hackers and scammers. Every day the news reports on new data breaches and scams. But, you can play an important role in protecting yourself from identity theft and fraud by taking small steps. Check your financial activity. It only takes a few minutes, but reviewing your bank, credit card and other financial activity and statements for fraud is an important first step. If you see any suspicious activity, report it. Don’t use the “remember password” option. Using this feature on your computer or mobile device makes it easier for someone to access your accounts. Set up automated account alerts. Get a text or email alert for certain transactions, balances and more. We offer free alerts through Merchants Bank Online Banking for your checking, savings and loan accounts and through My Mobile Money for your debit card transactions. Be cautious when asked for personal information. If you are asked to provide personal information through a phone call, email or website pop-up page, think before you act. Verify the company or person asking for the information through a third party, like a phone book or other trusted resource. Store private information securely. Whether at home or work, do not leave your personal information out where others can see it. Make a fraud kit. Keep a list of your credit and debit cards, account numbers, expiration dates and customer service of fraud department telephone numbers in a secure place away from the cards for easy access. Be a skeptic. If a situation sounds too good to be true, it probably is. You can’t win the lottery if you haven’t entered. You don’t need to send a payment to claim prize winnings. To stay up-to-date on Merchants Bank fraud alerts and scams, sign up for our alerts emails. As part of our privacy standards, we would like all Merchants Bank customers to have a privacy code in place to protect you and your data from being accessed by someone other than you. A privacy code is a word or numbers or combination between 4 to 30 characters that you choose and will easily remember. This will be used to identify you and protect your data from being accessed by someone other than you. It is not the PIN associated with a card, phone banking or online banking system. It is a part of identifying you as a person. Merchants Bank staff will use a privacy code to identify that it is really you on the phone before we give you information on your accounts. If you do not have your photo ID with you, we may also use this to identify you in person. Fraud and identity theft are increasing. Without a privacy code you may no longer be able to call in and obtain information over the phone. To set up a privacy code, please call or visit your local Merchants Bank branch. We all know the story of Rip Van Winkle who slept for 20 years and woke to find he’d missed the Revolutionary War and that society had changed dramatically. Today, poor Rip would find that a mere 20-minute nap may be enough to put him out of touch – especially when it comes to security. The attacker need do nothing and still gets paid. Ransomware either encrypts files on a computer or blocks access to the files. These programs used to be delivered exclusively in emails as an attachment that a victim would open. While that delivery method is still in use, the more pernicious versions simply roam the internet and when they find an unprotected network or computer, will launch the attack without human intervention. Stealing personal information and credit card data is still popular, but imagine how much work it is to steal, store, organize, and then find a buyer for that data. In short, the old fashioned methods of theft are a lot of work compared to a ransomware attack that threatens to delete all data on a computer unless the victim pays for the release. Attackers simply sit back and wait for the victim to pay. Want to go into business? Try ransomware as a service. Don’t know anything about computers or hacking? No need to worry. You can contract with a hacker and outsource your criminal activity. Organizations offering ransomware services are beginning to take root and will encourage bad actors of all types to try their hand at it. After all, what do they have to lose? The outsourced service provider does all the work and gets paid a cut of the take, and you merely await your share as the business owner. If one door is locked, just try another. The interconnectivity of the internet and businesses across the globe makes it much easier for a ransomware attack to succeed. Can’t get into a corporate network? Try the company’s version of webmail, which can be accessed from any computer in the world. Can’t get a user to click on a link? Then use in-memory malware to deliver the payload. Find it hard to scale your crime? Then hack cloud services and launch attacks against thousands of high value targets at once. In short, ransomware has multiple attack vectors. So what can I do to protect my business? Whether you run your own technology or outsource it, be sure you know what protections and processes you have in place. Anti-virus software, firewalls, and intrusion detection software with expert alerts, and patching systems and applications are regularly among these basics.More importantly, make sure your security tools are on the most current versions. This may mean having updates almost continuously at times as risk conditions can change dynamically. It’s good to look into new technologies as new threats arise, but remember that the tools you do have may be the best there are if kept up to date. Layer security across your business. No one single solution will protect you from every attack. Whether physical locks on doors, increasing the sophistication of passwords, using out of band authentication, or segmenting your network with additional firewalls, consider using a layered approach to make it more difficult for bad actors to get through to your valued information. This includes using the security and authentication steps offered by your bank. Most banks will provide tools that allow the business to verify financial transactions before they occur. Unfortunately, too many businesses fail to adopt these solutions and processes. Train your staff on proper use of the connected world we live in – and keep security awareness in the forefront of employees’ minds. The human threat is twofold: first, people make mistakes and as humans, we always will.Second, there has been a growing threat from insiders who are ‘groomed’ by bad actors to ultimately take part in a crime. While this is an unpleasant topic, it’s something every business owner or manager needs to consider today. One final thought. It would pay most businesses to be connected to an organization that monitors the global threat environment and can keep the business up to date on emerging threats. This external information can then be aligned with your internal IT steps and actions. There are several such organizations and many have very reasonable fees. The security issues faced by businesses will only be more challenging in the future. Staying up to date on security technology, being vigilant on how users interact with your systems, and having an eye to the emerging threats as they grow are all smart and necessary steps for any business today. While there are no sure-fire solutions to risk, by taking a multi-faceted approach you’re in the know about the threat environment, and you’ll feel better that you’re managing it in a sound manner. Then you’ll be able to sleep peacefully even with one eye open so as not to miss, as Rip Van Winkle did, the important things in life such as the birth of a nation. Merchants Bank will never initiate a phone call or email asking you to verify your Social Security number or account number. If you are asked for this information from another company, please proceed with caution. In these, or similar, situations, we may contact you. If you do not know the bank employee calling you, we encourage you to write down the information being requested and call the person back by dialing your local Merchants Bank office at a number you have verified on your own through a public source, such as a phone book, or call a bank employee you do know personally. For additional protection, you may set up a privacy code with the Bank. A privacy code is a 4-5 character combination of letters and/or numbers that the Bank will use to identify you over the phone. 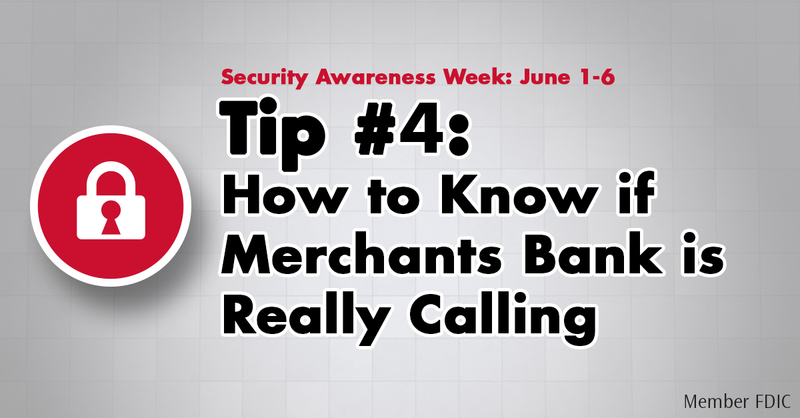 To set up a privacy code, visit your local Merchant Bank or contact your Customer Service Representative. Friendly reminder: In order for any communication between you and the Bank to occur, we need to have your up-to-date contact information. Please contact us if you’ve moved or made any changes to your personal contact information, such as discontinuing a landline phone or changing your cell phone number. You may also update your contact information by logging in to Online Banking and clicking on Other Services.